UNIVERSITY WOMEN'S COLLEGE FUND CONCERT. On Thursday night last at the Theatre Royal a large and appreciative audience attended the entertainment sponsored by the University Women's College Building Fund Committee. The first section of the programme consisted of a well-chosen selection of instrumental and vocal items, featuring the visiting examiners of the Queensland Board of Music Examiners, Messrs Sydney May, Archie Day and Miss Rhoda Felgate, assisted by local artists. Sydney May and Archie Day both gave piano solo items, the former playing Sonata in E Minor Opus 7 (Greig), and the latter Rhapsody in E Flat Minor (Dohnanyi). Their finale was Piano Concerto in G Minor (Mendelssohn). Their performance was received with rapt attention and the spontaneous applause which greeted its conclusion indicated the appreciation of the audience which included a number of young people who had recently been tested in musical and allied subjects by the examiners. Miss Rhoda Felgate chose 'The Great Lover.' by Rupert Brook for her item, and her charming interpretation of this classic indicated her mastery of her art. As an encore, Miss Felgate recited the 'Alexander Beetle,' much to the amusement of the audience particularly to the younger section, for whom it was obviously particularly intended. The visiting artists were ably supported by Mr. Hugh Harris, whose singing has delighted Townsville audiences for years. Mr. Harris sang 'I'll Follow the Road.' and for the encore which the audience demanded he sang 'You Table Your Job (and I'll Tackle Mine'). The instrumental trio, comprising Norma Melrose, Mrs. Eric Brown and Alfred Demarez, gave a delightful performance of the 'Andente Tranquillo' and 'Scherzo' from the trio in D Minor (Mendelssohn). The second portion of the Programme was a colourful programme of children's dances by the Gwen Hardie School of Dancing. The freshness and charm of the diminutive dancers and the finished performance of the older numbers of the class have a unique appeal and their performances are always appreciated by Townsville audiences. The third portion of the programme was a humorous one act play in which Aumorel (Val Illich) is seen slowly ruining the digestion of her husband Henry (Eric Reese) by her cooking which Henry describes as 'fair massacre.' Alice (Nino O'Sullivan) did not improve matters much by her insinuations and the questionable scheming of Wilfred (Jerry Scruton) aided by his unwitting wife Susan (Shirley Davidson) might have caused a serious rift had not Aumorel and Henry discovered in time that after all cooking is not everything. An enthusiastic audience heartily approved of the couple's final solution of their trouble. The play was produced by Mr. A. B. Shepherd, who was also responsible for stage effects. 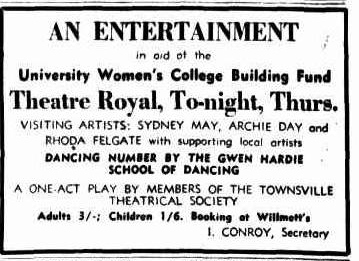 All the players are members of the newly formed Townsville Theatrical Society, and their very capable performance will undoubtedly cause Townsville theatre goers to anticipate with interest the forthcoming productions of the Society.